Scalping is a kind of speculation involving extremely short transactions lasting from several seconds up to several minutes. Profitability of scalping strategy is based on performing a large number of transactions closed with a slight gain, usually not exceeding a few pips. For scalping is recommended that a relatively large capital, high financial leverage, excellent knowledge of technical analysis and forex broker with low fees. First of all, the broker for scalping should have a very low cost of trade and high transaction reliability, lack of requotes. Also important is the size of leverage, preferred is high and the nature of broker. MM brokers may prohibit or impede scalping, sensible choice are NDD brokers (STP or ECN). brokers with a spread less than or equal 1 pip on EUR/USD pair with commission -OR- a spread less than or equal 1.5 pips on EUR/USD pair without commission. 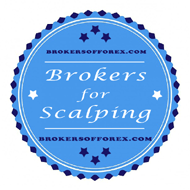 This list contains description of selected brokerage accounts that are best for scalping. Hot­Forex Broker HotForex offers account “Currenex” specially designed for scalpers. Idea of the account is promote scalping strategy, therefore this account has a low spread, the ability to trade through MT4, WebTrader and mobile platforms, and high leverage.